Fiona Hall continues with her research into Eugène Bourdon and his experience of World War I. 1915: Bourdon’s bravery and life at the Front. In 1915 Bourdon kept up regular correspondence with the School, and alongside the ongoing issues regarding his salary, it is clear that he also wished to be informed of events and life at GSA. He expressed interest in the development of the Roll of Honour and in the events of the Belgian Tryst. It appears that he received a copy of the programme of the Tryst, as well as copies of the minutes of the Governor’s meetings. It is obvious that the School and its activities were never far from his mind. Understandably, he took an interest in the students and staff that had also signed up for military service, and in several letters he enquires after them, fondly referring to them as ‘all my boys’ or ‘our lads’. It would appear that alongside army duties, Bourdon was tasked with other work. 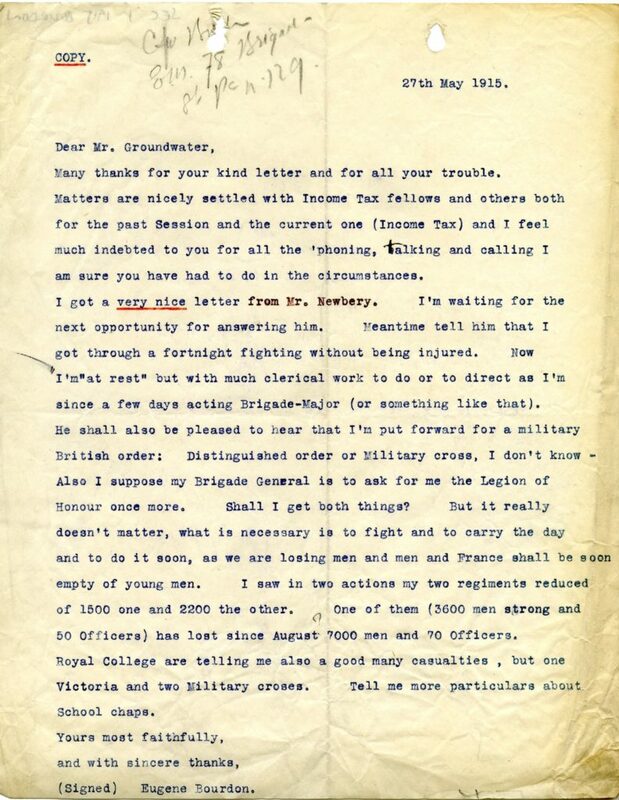 Writing in April 1915, he notes ‘divisional headquarters have discovered that I can draw and that I speak more or less English: hence much extra work for me’. Whilst reading through the correspondence, Bourdon’s bravery is acknowledged, and he himself writes to the School noting that he has been awarded the Knight of the Legion of Honour, a Croix de Guerre and a British Military Cross for his actions in the summer months of 1915. ‘I once more raise my hat to one of the bravest men that the French Army holds. We can only dimly realise what your heroic action meant, but I am sure from what we know of you that you attempted what very few men in any army would undertake…’. ‘Captain of Reserve, Eugène Bourdon…has always been remarkable for his zeal and untiring activity. In the course of the fighting of the 9th to the 25th May last, acting on his own initiative, he went under a violent fire of infantry and artillery, to carry important orders to the first fighting line. Captain Bourdon acquitted himself of his mission with an audacity and coolness that won the admiration of everyone’. Despite this admiration, Bourdon remained modest and hardworking. Although proud of his achievements, it is clear that even following the discovery of his nominations, Bourdon was fully aware of the bigger picture. Next week the story of Eugène Bourdon will continue in the last instalment of this series, ‘Remembering Bourdon Part 4: In the trenches’. Until next time!